Male eastern white pine cones and candle; photo by Eli Sagor on Flickr (noncommercial use permitted with attribution). The white pine (also the state tree of Maine) is considered the largest conifer in the northeastern United States. Maine's nickname is "the pine tree state" and the eastern white pine appears on the state flag, seal, and Maine quarter. Selection of a state floral emblem was inspired by the "National Garland of Flowers" at the 1893 World's Fair, which was made of individual state flowers or floral emblems which were specified by each of the state legislatures (many states selected their official flower symbol as a direct result of this garland). The resident's of Maine voted on three candidates: goldenrod; apple blossom; and the pine cone and tassel. Though the pine cone and tassel is not a flower, the choice is not surprising for the citizens of Maine (considering the role of the white pine in Maine's history). Botanically, the white pine cone and tassel are not flowers, they are gymnosperm (producing seeds without flowers). 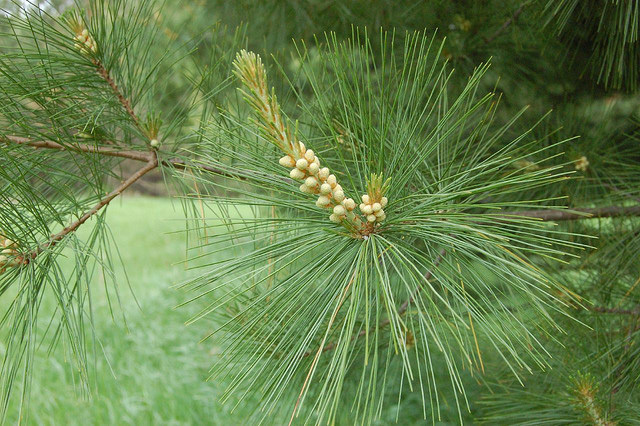 Pine trees have male and female cones; the male pine cones are small and fall off the tree after pollination. 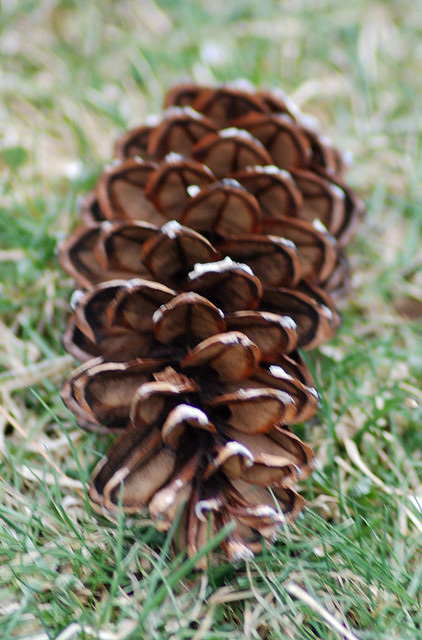 The female pine cones grow larger after being pollinated and take months, sometimes years to mature and fall. Female eastern white pine cone; photo by Bob MacInnes on Flickr (use permitted with attribution).